For years Esperance on Western Australia's south coast has laid claim to being the home of the world's best beaches. Now finally, thanks to the quest for that perfect social media photograph, the world has uncovered Australia's best kept secret. "It's just like nothing I've seen before," photographer and tourism operator Jaimen Hudson said of the crowds flocking to the remote town 10 hours drive from Perth. "I went to Twilight Beach the other day, it's the first time I've seen the entire car park full, the observatory car park full and cars parked out on the road." Likewise, local restaurants have been turning away customers all summer. "That breaks our heart of course but it's been amazing, we've never seen anything like it," restaurant owner Brian McMullen said. Many locals believe Esperance's ability to provide the perfect backdrop to the perfect social media photograph is behind the boom. Traditionally a farming town, Esperance is perched along side some of the most beautiful scenery in the world — snow white beaches, bubblegum pink Lake Hillier and turquoise water more akin to the tropics. Mr Hudson's aerial drone videos of a paddle boarder drifting over two southern right whales and dolphins surfing at his home beach have been collectively viewed more than 2.5 million times online. "I had a guy come in the shop just the other day and he said that he had travelled over 15,000 miles from England … he's seen my videos and he wants to drone the beaches himself," Mr Hudson said. "It's such a unique coastline and now with social media being able to share it for free all around the world, people are flocking here." The boat cruise operator said far more of his customers found out about Esperance through social media compared with other forms of advertising. The trend is reflected in the type of visitor too — Mr McMullen said 15 years ago his restaurant staff would get excited if just one international customer dined at the restaurant. "Now international is huge, we get a lot of people from Germany, China, Switzerland … some nights it's like a league of nations in there," he said. Alexandra Cameron and her boyfriend, Jacob Druce, are travelling Australia in their 1983 Coaster van "Conny" and discovered Esperance through a stray hashtag. "I was like, 'what is this place? '," Ms Cameron said. "I'd never actually heard of Esperance before until I saw that Instagram account, so once I saw how beautiful this area is, I was like, 'we have to go there'." Ms Cameron is part of the phenomenon of "van lifers" who travel countries living out of a van converted to a mobile home, documenting their journey on the internet. Rather than relying on traditional visitor centres, van lifers mostly use social media for information. The couple are now working the busy summer holiday period in the town, posting photos of kangaroos at Lucky Bay and idyllic beach scenes in their down time, and have found they are now being contacted online by other travellers for local advice. "People who are international somehow find my account — I'm guessing through hashtags — have seen Esperance and gone, 'This chick looks like she knows what's going on, what do I do when I get to Esperance?'" Ms Cameron said. The challenge for the local tourism industry is how to capitalise on this influx of visitors — Esperance's accommodation is largely booked out for the summer school holidays. 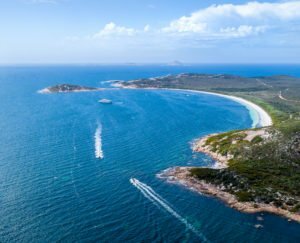 Industry operators say to really benefit and grow the local tourism industry, visitors need to be convinced to come to Esperance either side of summer or even in the depths of winter. Mr Hudson said social media could again be the key to that — pointing out in posts what month of the year the spectacular photo was taken. "Quite often March, April, May, they're some of our best months because you don't get the hotter days," he said. "[It's] still 20-25 degrees but you get no sea breeze in the afternoon, it's glass off calm."